The celebration of the life and legacy of Dorothy Foreman Cotton Aug. 11, 2018 in Bailey Hall provided highlights of her life as a civil rights pioneer, educator and community organizer and called on participants to keep her legacy alive. Attending were representatives from five generations of Cotton family members and about 700 local and national leaders, friends and community members. A close colleague of the Rev. 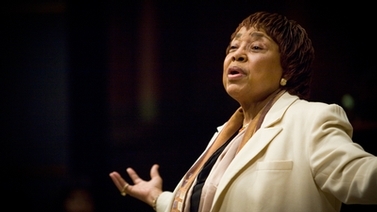 Martin Luther King Jr., Cotton was the highest-ranking woman in the Southern Christian Leadership Conference in the 1960s, where she led the group’s Citizenship Education Program, teaching literacy, citizenship and the tactics of nonviolent protest. A role model for women, she served as director of student activities at Cornell from 1982 to 1991. She subsequently led seminars and workshops on leadership development and social change, and published a memoir in 2012. She died June 10 in Ithaca at age 88.